As parents we are always looking out for the welfare of our children. We make sure they have enough to eat, clean clothes to wear, and a good education. One thing that often gets overlooked though is helping them achieve a strong financial footing when they grow up. Opening a child savings account can be a good way to ensure their financial security later in life. 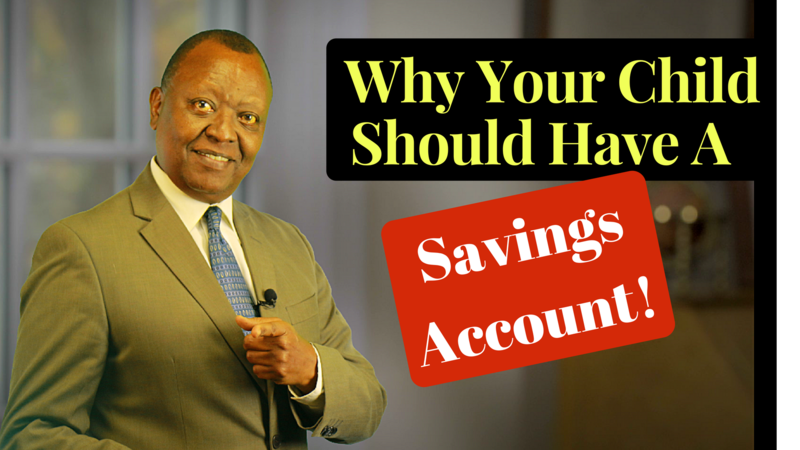 The question we answer today is; should you open a savings account for your child and if so, why? Please CLICK HERE to watch on You Tube. Opening an account for your children while they are still young accomplishes a few goals. First of all, you won’t have to deposit a lot of money weekly, or monthly, to have a very large nest egg for your kids when they need it. If you start early enough by the time they’re ready for college you could have thousands of dollars saved even if you were only able to make small deposits and didn’t receive a very high interest rate. Another benefit of opening an account for your kids is that you are teaching them sound financial habits from a very early age. Most kids don’t get much financial education at school or at home. This puts them at risk when they go off to university and the mobile phone loan companies and credit card companies are there just waiting to sign them up for a phone loans and credit cards. That is the first step to financial problems for many young people. They simply don’t have the knowledge to handle credit and they quickly get in over their heads. As soon as your child is old enough encourage them to participate in the banking process. Take them to the bank when you make a deposit, show them how to fill out a deposit slip, encourage them to put a little into their savings account whenever they get some money for birthdays or holidays, etc. One word of caution: saving is a good financial habit to start but you don’t want your kid to grow up with a feeling of scarcity or lack. You want them to understand that having their own cash to use if something unexpected comes up is true freedom but you don’t want them always thinking about and preparing for the ‘worst’. Please CLICK HERE to watch on You Tube. Make sure they keep their saving habits in balance. They need to be able to spend their money occasionally too. That’s the only way they’ll learn how to be savvy shoppers later in life, and they need to learn that money, and to a degree, things can be a good thing to have. It’s a reward for working hard at a job. Bad habits are like a plant. When they are new like a young sapling, they are very easy to do away with. As they take root, it becomes more difficult to uproot them and finally when they mature, it will need a superhuman effort to do away with them. Nowhere is this observation truer than in people’s financial habits. The earlier in your life you weed out destructive habits the better off you will be. If this is true, it must be even truer that if young people start out their economically productive lives with good money management habits, they will be spared a lot of grief, hardship and frustrated ambitions. As parents, we have the responsibility to try and give them that good start in life. Many parents make the mistake of waiting until their children begin working then tell them that they should be “wise with their money”. They then keep complaining that the children are irresponsible because they keep coming home to be bailed out of this or that financial problem. The mistake such parents have made is not to start financial education early enough before bad habits take root. They are also guilty of sending out their offspring into the harsh and cruel world without any practical guidelines as to how one should manage their income (“be wise with your money” is not practical advice). They may also have unwittingly laid a foundation for future difficulties with money in the subconscious minds of their offspring. Helping your child achieve a secure financial future can start with such a simple thing as opening a child savings account while they are still young. Teach them strong financial habits from an early age and they will be far less likely to get in over their head when they grow up. Please CLICK HERE to watch on You Tube.